Dosage:This strip will protect a 3-5 ton system for 6 months. Protects:Helps to prevent drain pan overflows. Prolongs:Helps prevent drain pan corrosion. Healthier:Eliminates foul drain pan odors, Improves your Indoor air quality. 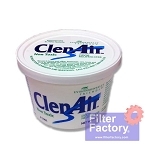 Improves your Indoor air quality. One of the most polluted places in your home, is in you central air conditioners condensate pan. This is a water collection pan that sits under your cooling coil. With all the ingredients for biological growth, it's usually a major source of sick building syndrome. Just place this PurCool strip in condensate pan or humidifier to stop contamination at it’s source. Time release formula fights disease causing contaminants 24 hours a day! Originally developed for professional use on central air systems, PurCool is now available for residential and other commercial uses. 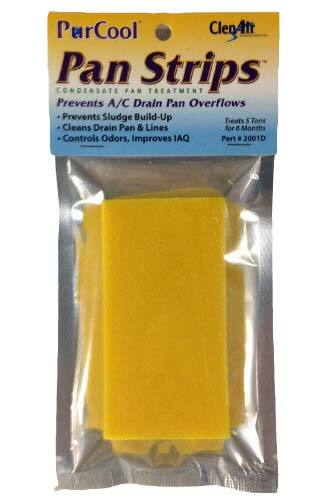 Helps to prevents damage from plugged drains by eliminating slime. 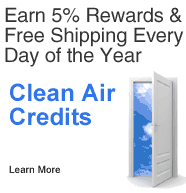 11 Clean Air Credits will be rewarded to you when you buy this item.